Choosing someone to design a website for your small business can be a nerve-wracking experience. More often than not, you’re asking someone you’ve never met in person to provide an important service for you. This service does not come cheaply, and if it doesn’t turn out the way you’d hoped, you’re out a lot of money. I once had a small online boutique called Country Swank. When I started, all I knew was that I wanted to sell women’s handmade jewelry, clothing, and accessories, but I didn’t really know much about how to make that happen. My husband convinced me to create an online store, so we hired a website designer out of California that was referred by someone we knew. I didn’t do any research, didn’t know the right questions to ask, and in the end, I was just left pretty frustrated. A few years later, my husband worked with a different designer to create a website for his counseling-related business. That website turned out pretty okay, but the guy was nearly impossible to reach. Any time my husband had issues with his site and needed to reach the designer, he couldn’t. He had to find someone else to help him resolve issues created with the website designed by the other guy. Needless to say, being an online entrepreneur has created many learning opportunities over the years. Both of those websites mentioned before were on Wordpress, which ended up resulting in constant headaches from updates and compatibility issues. Plus, if we ever needed to make changes, we could do the very basics, but not change any part of the design without paying someone else to do it. I now specialize in creating Squarespace websites for small businesses because I wholeheartedly believe it is the best fit for someone in this position. As an all-in-one solution, Squarespace is user-friendly, and has the capability of streamline your work processes instead of hindering them. So, how do you avoid the worst-case scenarios that we went through in the beginning? It seems obvious, but it’s really not. You may get a referral to use someone from a friend, but not everyone’s needs are the same. Your friend might run a local flower shop, and you sell custom made jewelry to customers around the world. Those businesses will need different functionalities on their website. Take your time, do your research, and look at the available options for what your small business needs. You don’t have to accept the first option presented to you - look around and do some comparison shopping. When you send an email, how quickly do they get back to you? Sure, you can assume that they’re probably busy, but as a prospective client, they should be working to earn your business. If they don’t respond to an inquiry within 24 hours, move on to the next designer. If they can’t provide you with a response any faster than that when you’re a potential paying client, imagine what it will be like when they already have you locked in. This is very subjective, but you’re going to work very closely with this person, so you need to get along. If you’re a very soft-spoken person, and the designer you’re considering is very loud and brash, you won’t enjoy the process. Do you feel like you can have an easy conversation with them? You want to feel like they “get” you on a personal level, and will listen to your input. When you talk with a designer about their process and what you can expect, consider how specific they are. If they give you step-by-step details about their process, you can feel confident that things will move along smoothly. If they don’t seem to have a process and just address things as they go along, you will be on a long and winding road to your new website. What is their design style? I design fun, colorful websites for family-friendly businesses like bakeries, party halls, daycares, etc. My style is probably not suited to an attorney, accountant, or mortgage broker. Take a look at your potential designer’s portfolio and consider not only how well their sites are done, but if that style suits your business. If what you’re wanting is in line with what they do on a regular basis, you’re more likely to have a better outcome. You don’t want to put a square peg in a round hole, so to speak. When do you want and/or need your website done? 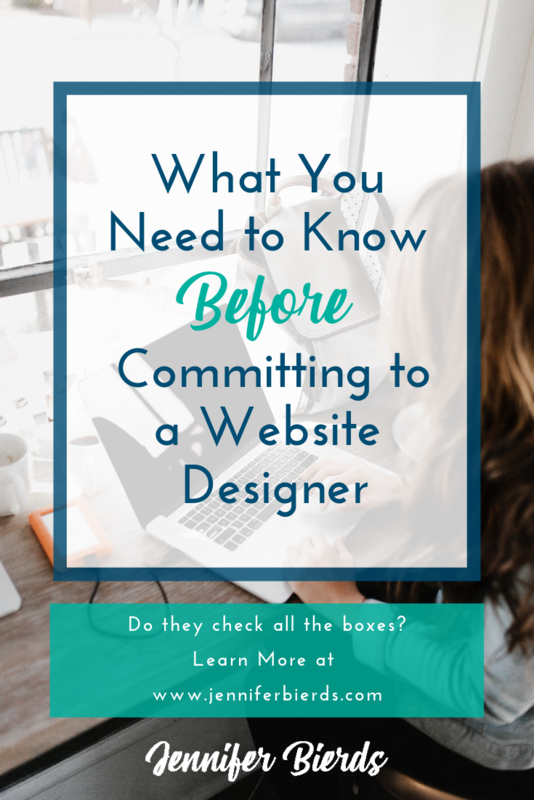 Designers have different processes that vary in length, so consider how long it will take for your potential designer to complete a website for you. They may tell you it will take 2 weeks, a month, or more, but avoid an open-ended timeline if possible. The design process can drag on if you haven’t agreed on and end date. Cybersecurity is a hot topic for a reason - it should not be taken lightly. If you’re talking with a designer who mentions you giving them passwords so they can access various things with your login, don’t do it. There are always ways around a designer using your personal login information. What platform are they designing your website on? Are they using Wordpress? Squarespace? Wix? GoDaddy? There are things to consider with each of them, and of course, I prefer Squarespace (read why here). Just make sure that you do your research and are comfortable with using the platform after they’re gone. If you’re not, know that you’ll have to pay someone an hourly rate to help you with maintenance. As I’ve gotten older, I’ve finally learned this lesson the hard way. You are paying for a service, and it’s okay to speak up. You shouldn’t feel like you’re a burden, or that you’re inconveniencing them. If you want something, just ask. The worst anyone can say is “no”, and if you don’t ask for what you want, you’ll probably regret it. 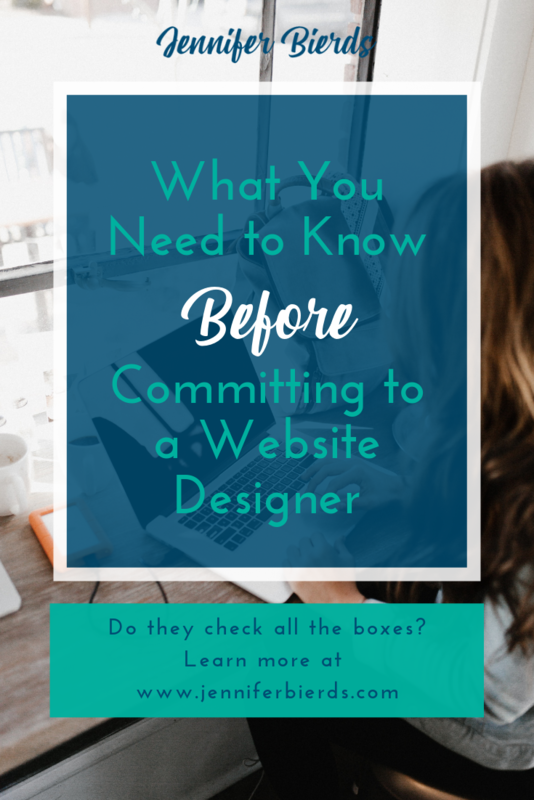 If you’re in the market for a new website, take your time in choosing a designer and make sure you’re a good fit to work together. That is why I offer a free consultation call for all of my potential clients, and it’s not a bad idea for you to use these types of calls to answer the questions above. I’d be happy to chat with you about how I can help your small business succeed with a new Squarespace website. Book your free call now, or click below to see my portfolio!